Home Improvement Contractors and Hurricane Sandy? 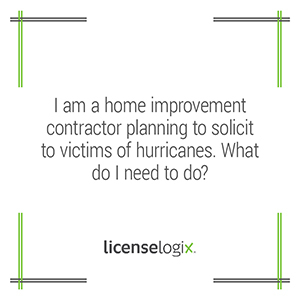 If you are a home improvement contractor planning to solicit residents in any of the following states (or any other state), you must become licensed first. Unlicensed contractors may be subject to severe penalties, and, following a natural disaster, many states increase efforts to enforce licensing laws (see Unlicensed Contracting in Disaster Areas Brings Heightened Enforcement of Contractor Licenses). Let the experts at LicenseLogix guide you through the processes of each jurisdiction so that you can get to work as soon as possible. Contact us today! Connecticut: Under the Connecticut Home Improvement Act, no person may undertake, offer to undertake, or agree to perform any home improvement in the State without first registering as a Home Improvement Contractor with the Department of Consumer Protection. Unregistered contractors may be subject to various penalties. To obtain a certificate of registration, a contractor must submit an application, supporting documentation, and a $220 fee. Maryland: Under the Maryland Home Improvement Act, no person may offer or perform any home improvements in the State without first obtaining a Contractor License from the Department of Labor, Licensing and Regulation’s Home Improvement Commission. Unlicensed contractors may be subject to fines up to $5,000 or even imprisonment. To become properly licensed, a contractor must submit an application, supporting documentation, and a $370 fee. Massachusetts: Under Massachusetts General Law, no person may solicit, bid on, or perform residential contracting in the State without first registering as a Home Improvement Contractor with the Office of Consumer Affairs and Business Regulation. Unregistered contractors may be subject to various penalties. To become properly registered, a contractor must submit an application, supporting documentation, and a fee ranging from $250 to $650 (dependent upon number of employees). New Jersey: Under the New Jersey Contractors’ Registration Act, no person may engage in the business of making or selling home improvements in the State without first registering as a Home Improvement Contractor with the Attorney General’s Division of Consumer Affairs. Unregistered contractors may be subject to civil penalties up to $20,000 and/or even criminal charges. To become properly registered, a contractor must submit an application, supporting documentation, and a $90 fee. New York: New York City and its surrounding counties each require its own Home Improvement Contractor License for any person providing home improvement services with its jurisdiction. As there is no statewide license, a contractor operating in multiple counties must obtain multiple licenses. Each County’s licensing process, generally handled by its Department of Consumer Protection, requires its own application, supporting documentation, and fees. To legally provide services in the counties of Suffolk, Nassau, and Westchester, you must apply for and obtain three separate licenses. Unlicensed contractors may be subject to various penalties. Pennsylvania: Under the Pennsylvania Home Improvement Consumer Protection Act, no person may hold himself out as a home improvement contractor or perform any home improvement without first registering as a Home Improvement Contractor with the Attorney General’s Bureau of Consumer Protection. Unregistered contractors may be subject to various penalties. To become properly registered, a contractor must submit an application, supporting documentation, and a $50 fee. Virginia: Under Virginia Law, no person shall engage in, or offer to engage in, contracting work in the Commonwealth without first becoming licensed with the Department of Professional and Occupational Regulation’s Board for Contractors. To become properly licensed, a contractor must submit an application, supporting documentation, and a fee ranging from $385 to $235 (dependent upon license classification). In addition, any locality in the Commonwealth has the authority to require any person engaging in the specific business of home improvement to obtain an additional license. Contractors that are not fully licensed may be subject to various penalties, both by the Commonwealth and the local government where services are being performed. West Virginia: Under West Virginia Law, no person shall undertake or offer to undertake to provide home improvement services without first becoming licensed with the Division of Labor’s Contractor Licensing Board. Unlicensed contractors may be subject to various penalties. To become properly licensed, a contractor must submit an application, supporting documentation, and a $90 fee. Please note that LicenseLogix handles all types of contractor licenses, in addition to home improvement contractor licenses. If you are unsure whether your business needs a license in a particular jurisdiction, you can contact us via chat, email, or phone (800.292.0909) any time.